Since his emergence onto the scene in 1989, composer/soprano saxophonist Rob Reddy has established himself as an adventurous and original leader in the contemporary jazz realm. Prolific, eclectic and versatile, Reddy is recognized by musicians, critics, and funding institutions. With his new recording Citizen Quintet, Reddy adds another powerful milestone to his reputation. Citizen Quintet is his eighth album where Reddy is again fully within his own territory and in the company of a superb group of musicians – trumpeter John Carlson, guitarist Brandon Ross, double bassist Dom Richards and drummer Pheeroan akLaff–all regular collaborators of his for more than 20 years. 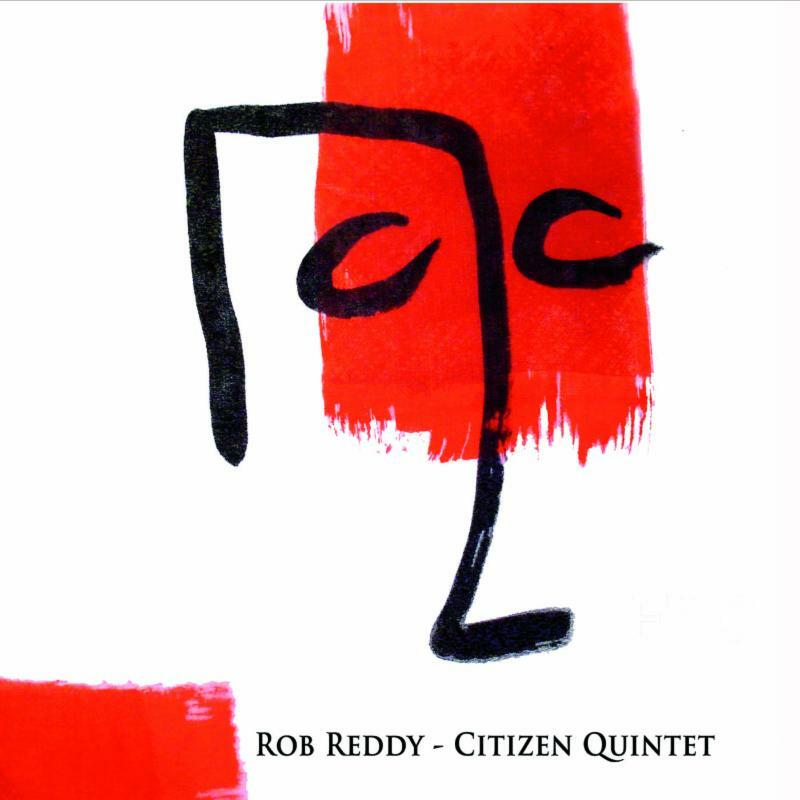 With Citizen Quintet, Reddy has purposefully diminished the emphasis upon the compositional form on behalf of a looser and more open approach to the creative substance, allowing the musicians’ longtime familiarity to breathe more freely. As a result, Reddy says “this session had a real joy & ease to it.” Indeed, the sense of joyful turbulence and free-reined expressiveness that is so fundamental to the music of the Art Ensemble of Chicago, Sun Ra and Albert Ayler is vividly displayed throughout this album. But this is no free improv or loose-knit blowing album by any means. There is a rich and complex structure and overall sense of purpose and shape always in full bloom. Reddy states, “Within the confines of five instrumental voices I attempted to break the ensemble down…solos, duos, trios, entire ensemble improvisations… I continue to explore the idea of juxtaposing the composed melodic material and the improvised music with one another.” They emerge from the compositional structures and sometimes the process is reversed–and often combined. Written and improvised lines are sometimes blurred, sometimes intersected and sometimes indistinguishable within the pure musicality and extraordinary musicianship of the members of the ensemble. Striking unison passages, stirring anthems, arresting harmonies, atmospheric rubato, and a rollicking sense of energetic jubilance are all part of the compositional structure and improvisational interplay. The individualistic voices of the musicians combined with their impeccable artistry and consummate sense of creativity make the music shimmer with excitement and vitality. Reddy uses one collage-like piece in three parts to create a web of context to anchor the album. “Hear Me?” opens the album, while “Hear Me? (Very Slight Return)” emerges a bit more than halfway through, with “Hear Me? (Slight Return)” closing the album out. Swaggering blues, hollering unison, mesmerizing chants and collective exchanges at the highest level create a sumptuous aura that makes the listener feel that they are waking from a lovely dream each time this mosaic reappears. Richly dense atmospheric excursions are at play for a pair of extended pieces. “Time Smells Good” opens with crystalline guitar also; darkly ominous with impending danger, then ushering in a lovely slow drag dirge that sets the foundation for Reddy’s sinuous, serpentine solo. Fluttering soprano opens “Redemptive Grace,” a smoothly grooving waltz time sojourn, with exceptional guitar/bass interplay over delicate percussion opening up the way for a riveting guitar solo and sparkling soprano. The captivating Art Ensemble of Chicago vibe is invoked on two other items. “Right as Rain” has an Ornette-ish compositional line in rubato, with visceral individual statements emerging from the compositional mass; and “Duck Duck Goose” is a delightful “battle” that pits soprano and drums against trumpet, guitar and bass. Carlson’s dynamic talents are showcased on “Paralysis Of Analysis,” opening on an inspired trumpet cadenza eventually underscored by an explosive, rapid-fire, starkly syncopated and suspended line that buoys his exhilarating solo. “Forsaken’s” richly syncopated unison melody lays the foundation for a full ensemble improvisation that constructs a fervid and impassioned wall of sound. The whimsically sardonic spirit of one of Reddy’s greatest mentors, Makanda Ken McIntyre, is on hand for the delightful “Without a Paddle”, staggering like a happy drunk, with echoes of Reddy’s Bechet project in Richards’ tuba-like bass. There is a European artistic giant who does come to mind in terms of Reddy’s musical approach – the immortal filmmaker Ingmar Bergman, who maintained a steady group of collaborators in front of and behind the lens to shape his most singular vision. A true modernist, Reddy draws upon the full palette of jazz expressionism rather than the Modern European milieu that flavors many of today’s more daring composers.